A personalised children's backpack with a dinosaur design. The backpack is personalised with your chosen name and is available in red or green. A personalised children's backpack with a flowers design. The backpack is personalised with your chosen name and is available in red or green. A personalised children's backpack with a princess design. The backpack is personalised with your chosen name and is available in red or green. A personalised children's backpack with a princess castle design. 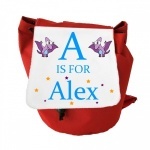 The backpack is personalised with your chosen name and is available in red or green. 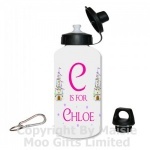 A personalised water bottle great for your little princess. 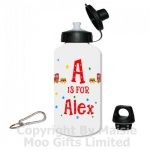 A personalised water bottle great for your little prince. A personalised baby's 1st christmas tree ornament. 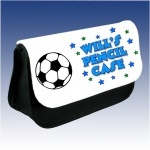 A personalised pencil case great for a football fan. The pencil case is available in different font colours and the case is available in black or red. 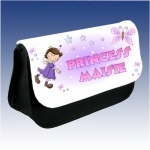 A personalised pencil case great for a little princess. The pencil case is available with three designs of fairy and the case is available in black or red. A metal hanging heart for the christmas tree in a Baby's 1st Christmas design. A metal hanging heart for the christmas tree which is personalised with a child's name. Available in six different designs. A metal hanging heart for the christmas tree in a Baby's 1st Christmas design with Santa & Reindeer. 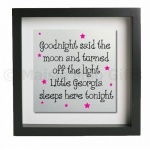 Available with pink or red font. This magic Santa key is brass coloured and made from metal. It has a red and gold ribbon attached with a metal keyring. The whole key is gift boxed in a box that says Special Delivery From The North Pole in silver foil. A cute Personalised Prince ceramic kids size mug. A cute Personalised Princess ceramic kids size mug. This baby bib is personalised with your baby's name ready for their 1st Christmas. This baby bib is personalised with your baby's name ready for their daddy's 1st Fathers Day. This baby bib is personalised with your baby's name ready for their mummy's 1st Mothers Day.